I have a confession: this dress and blog post have been complete for about two weeks now, but this is the first opportunity I’ve had to take pictures. Oops. Anyway, say hello to Cambie #4! Or, a dress I can wear to places other than cons. I made this dress as part of my garment challenge. 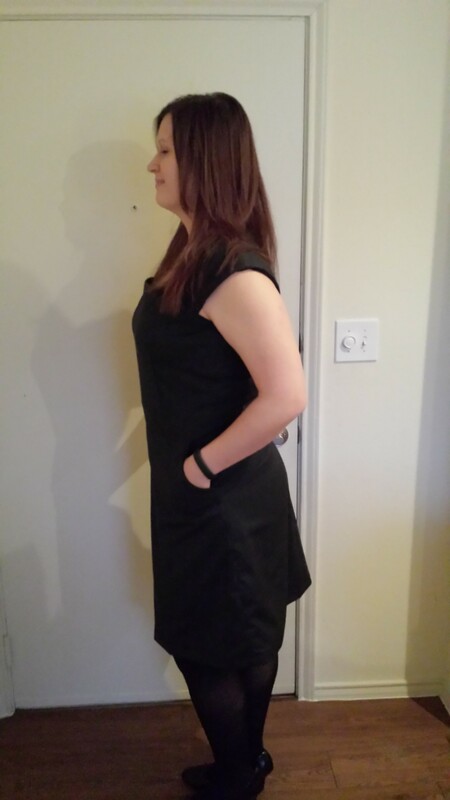 I wanted something practical, comfortable, and versatile that I could wear to work. 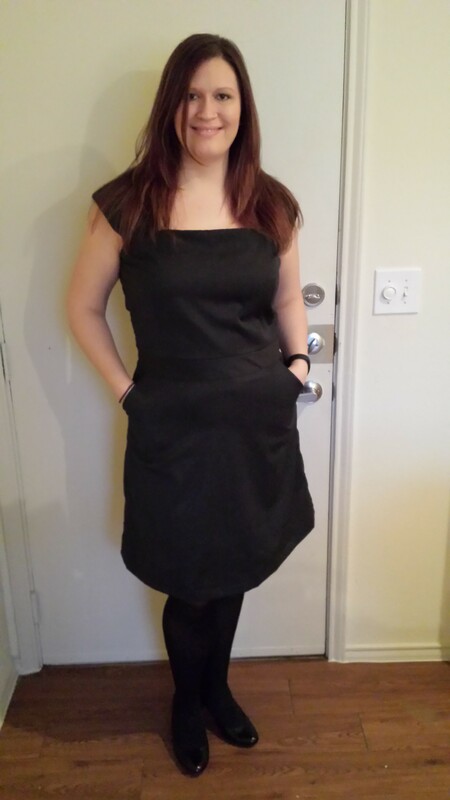 The Cambie is one of my favorite dress patterns, so it was a clear winner for my first garment of the new year. Front view. Oh dear glob, I need a haircut. Side view. I love me some pockets. Not sure what’s going on with my face. Pretty sure my BF is king of the awkward shots. Pattern: Sewaholic Cambie, view A. Fabric: 2 yds of grey Italian grey wool suiting blend from my newest fabric obsession, Golden D’or. Alterations: Added 1″ to the bodice, opted for the square neckline variation, took out the front darts, understitched the bodice, and some minor tweaking for fit. Time: 10ish hours. I finished the inside seams of the shell with a Hong Kong finish and also had some funky fitting issues. 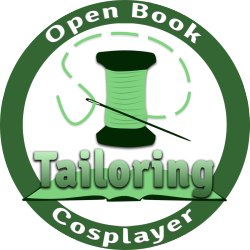 Notions: Invisible zipper, bias tape used on the lining. Make it again? Yes, after I get through a few other patterns. I’m thinking a pretty cotton sateen for my next go. Favorite parts: Pretty sleeves, slash pockets, flattering design. Other thoughts: WARNING: wall of text ahead. I have some mixed thoughts about this dress. Now that it’s done, I like it, but it almost became a UFO (unfinished object) on several occasions. The fabric is what really inspired this dress. I saw it on my first trip to Golden D’or in January. I bought it intending to make a pair of Juniper trousers, but then quickly changed my mind when I realized I could squeeze a Cambie and a pencil skirt out of my yardage. Score! Since this fabric is a wool blend, I decided to err on the side of caution and use Eucalan in case of shrinkage. Problem was, my only local distributor was closed, so I had to wait a week for Amazon before I could even pre-treat my fabric. Ok, no big deal. I decided I’d use the time to make a muslin of the skirt since the A-line skirt is much more fitted than the gathered skirt. Fast forward a week. Once I started cutting, I discovered that some of my pattern pieces were missing, so I had to redraft those based on previous Cambies. My biggest problem cropped up when I tried to attach the bodice to the skirt. My hip measurements are a size 10 in Cambie land (for reference, my bust is a size 16), but I forgot to allow for differences in darts and seam placement. Sigh. The easiest way to fix that mistake was to take out the front darts. I left the unmatched back darts in the back since I wear cardigans a lot at work (see: lazy). It’s a bit hard to see, but those darts in the back are off by about 1/2″. Also, STUPID HAIR. HELP ME HAIR GODS. I had some trouble with the sleeves as well, partly because the sleeve lining is one of the pieces I had to redraft. I wound up taking about an inch off of them, which also helped with some weird drooping around the neckline. Speaking of the neckline, I understitched the lining since I didn’t have quite enough fabric for a facing. At least, not with the pencil skirt from hell. I guess this dress also *could* count for my new skills challenge, since I actually tried out my blind hem foot on this beastie. I think it turned out pretty well. I did the hem on the lining first so that it wouldn’t be visible if I messed up too much. Still, all trouble aside, I think it turned out okay. I’m glad I stuck it out and finished. My sewing mojo has been really off lately, so finishing feels like a big accomplishment right now. I mentioned that my work wardrobe is sadly lacking. My workplace dress is fairly casual, but I think this piece will be great for when I have to give presentations/instruction sessions and attend conferences. I still think it’s funny that I became a librarian partially out of severe introversion, but I do a metric crap ton of public speaking every semester. Tl;dr I screwed up, but at least it’s passable and I know what to fix next time. Also, I desperately need a real camera. Phone and iPad shots just aren’t cutting it anymore. Any suggestions?